INTJ Diaries: I Love You. Most Ardently. I attended a ball the night before last and have managed to alienate myself from every moderately beautiful woman in the room and, in doing so, most of the pleasanter gentlemen as well. It's a miracle Bingley still spends time with me. I wish I was as charming as I am rich. Can you buy conversing lessons? Flirting lessons? Sigh. INTJ flirting. Like sighting a unicorn on a cold winter's morn, this almost unheard of phenomenon does actually happen from time to time. If you want to witness it, you must watch very closely--blink and you might miss it. For me, there are only two fictional characters whose MBTI type discussions bring to mind the words fight me: Sherlock Holmes and Mr. Fitzwilliam Darcy. Mr. Darcy is the poster child for a “normal” INTJ. He's not classified as a genius, he’s not a morally-lacking sociopath, and he's not unnecessarily rude to everyone. At least not purposely. Everything he does stems from his undying devotion to those he cares about and his lack of social graces due to his misunderstanding social cues and his bluntness. He thinks he's smarter and better than everyone in the room--and, to be fair, he is the richest, which amounts to the best in that society--but when he meets his match in Elizabeth Bennet, well, he's intrigued. To put it lightly. In all reality, meeting Lizzy Bennet sends him in an obsessive downward spiral full of confusion and self-loathing until he realizes he needs to stop being so… rational. Their relationship, like any good INTJ relationship, starts out with teasing and irritation on her side and confusion and cluelessness on his. He refuses to dance with her at the ball and calls her “barely tolerable,” but we’ll get back to that in a moment. The most important scene in the Darcy/Lizzy relationship, in my opinion, is the scene in Netherfield’s sitting room after Jane has fallen ill. Lizzy, Caroline, Mr. Bingley, and Mr. Darcy are discussing character. So Lizzy, of course, tries to find a fault of his that she can tease him about. He’s more than willing to oblige: “I have faults enough,” he says, “but they are not, I hope, of understanding. My temper I dare not vouch for. It is, I believe, too little yielding; certainly too little for the convenience of the world. I cannot forget the follies and vices of other so soon as I ought, nor their offenses against myself. My feelings are not puffed about with every attempt to move them. My temper would perhaps be called resentful. My good opinion once lost is lost for ever” (57-58). If you’ve never met an INTJ in real life, well, this is what we look like. On the upside, though, while our good opinion can be lost forever, once it’s well-formed, it’s incredibly hard to shake. Hence the reason Mr. Darcy falls crazy in love with Elizabeth and can’t talk himself out of it, despite how much he tries. Lizzy goes on to say that she can’t very well laugh at that, and he responds that every disposition has a tendency toward an irremediable defect. “And yours,” he replies with a smile, “is willfully to misunderstand them” (58). Thinkers and Feelers, y’all. INTJs will never understand how someone could purposefully see something in someone that isn’t there, whether it’s choosing to believe that everything they do is magic or choosing to see only their worst traits. Feelers (specifically that group that includes INFJ, INFP, ENFJ, ENFP) have no problem with this dichotomy of thought. Hence most of the difficulties Lizzy and Mr. Darcy run into while falling in love. But back to the ball. ...she has suddenly become much more attractive to him, even though her face and body have not changed in the slightest. In order to be loved by an INTJ, you not only have to attract their body, you have to first and foremost attract their mind. He stands quickly and awkwardly when she gets into the room and then, when she asks a question, he makes sure that he’s the one to respond. So he says the first helpful thing he can think of and then probably mentally facepalms for the next half hour. Then, of course, comes the pivotal sitting room scene in which they begin to understand one another. 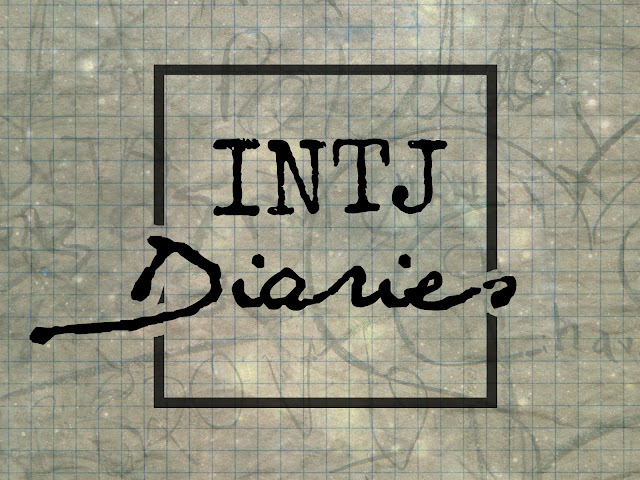 They continue, for the rest of the story, to get into fights based on misunderstandings (one of the only reasons an INTJ will get into a true fight), and to learn more and more about one another: her by asking questions, him by trying to explain himself. An arduous task, to be sure. When they’re discussing the ball, he tells her the true reason that he danced with no one: “I am ill qualified to recommend myself to strangers. [...] I certainly have not the talent which some people possess of conversing easily with those I have never seen before. I cannot catch their tone of conversation or appear interested in their concerns, as I often see done” (174). He’s not being a snob, he’s being an INTJ. Totally in over his head in social situations. But he doesn't hold a grudge because she's still a cool person. Fast forward in time and Lizzy learns of Lydia’s elopement with Wickham, for which Mr. Darcy just happens to be present. Her face goes pale, and he goes Oh no. What’s wrong? What do I do?? So offers her something to drink. Seriously: “Let me call your maid,” he says. 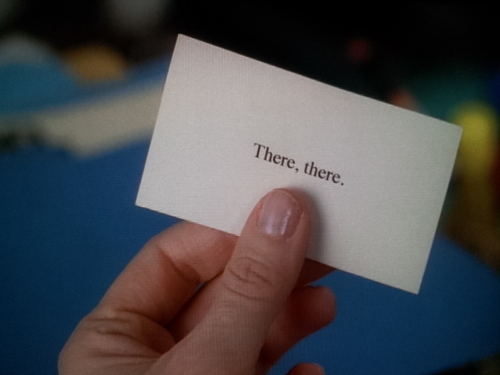 “Is there nothing you could take to give you present relief? A glass of wine; shall I get you one? You are very ill” (268). I can almost see his hands fluttering uselessly around her. When he proves fairly useless at comforting her, he naturally turns to the next most helpful thing he can think of: paying off Wickham to marry Lydia. Because we INTJs don’t believe in doing anything halfway. But he doesn’t do it for Lizzy’s attention--he actually tries to keep it a secret. However. He tries to keep it a secret with Lydia, so there’s a good chance he knew it would get back to Lizzy. And impress her. INTJ flirting instance number two. He even tells her, much later, that he thought only of her (354). Because flirting, like jokes, is best when explained three weeks after the fact. Some time later, at a dinner party, Lizzy attempts to talk to Mr. Darcy and runs out of topics of mutual interest. “She could think of nothing more to say; but if he wished to converse with her, he might have better success. He stood by her, however, for some minutes, in silence; and, at last, on the young lady’s whispering to Elizabeth again, he walked away” (330-331). INTJ flirting number three. Flirting? you might ask. Yes, I would respond. Sort of. Let me enlighten you to what was probably going on in his head: He answers Lizzy’s last question. I should introduce another topic of conversation. There’s nothing interesting to follow that statement. Why didn’t I say something more interesting? Maybe she has something else to say. I’ll stay here. This silence is stretching on for a really long time. I should say something. But now it’s been too long. Saying something would be too awkward. Someone starts whispering to Lizzy. Oh gosh they’re talking about me. She doesn’t actually want me hovering awkwardly over her. Why am I still standing here? He moonwalks awkwardly away with his tea. He wanted interactions to happen. He gave words the chance to happen. He answered everything she asked him. But then his mind got the better of him and he left, disappointing both of them. Then he proposes. Again. Those darn unchecked emotions just won’t go away, and Lizzy has just given him a reason to hope (by telling off his aunt--could she get any more intriguing?). So he tries again, for the--even if she had rejected him--last time. An INTJ’s pride can only take so many hits before we crumble and turn into curmudgeonly old hermits. “My affections and wishes are unchanged; but one word form you will silence me on this subject forever” (354). Even if she had rejected him a second time, his affections would have remained unchanged. Even if he had married--happily--and had a good life, his affections would have remained unchanged. See, he fell in love with her because he found her interesting. Being interesting made her attractive. And all of this together led him to think that they would be a good match for each other. Given the amount of time he’s had to come to this conclusion, it’s very unlikely that it would ever change without some kind of irreparable disaster. So he could be happy with someone else, but he would forever believe that he and Elizabeth would have made a good match. But he says he will respect her wishes. He does this, obviously, because he is a gentleman. But also a little because his pride at this point is a bit fragile. He was vulnerable once and she attacked. Once more and he might not be able to handle it. She accepts. He breathes a sigh of relief, asks her father for permission, and the two live happily ever after. But she wants to know why. Why did he fall in love with her? Why did he fall in love with her? His response melts my heart--partially because I want someone to say it to me and partially because I’m like yes! someone understands! “I cannot fix on the hour, or the spot, or the look, or the words, which laid the foundation,” he says. “It is too long ago. I was in the middle before I knew that I had begun” (367). INTJs and their emotions, man. 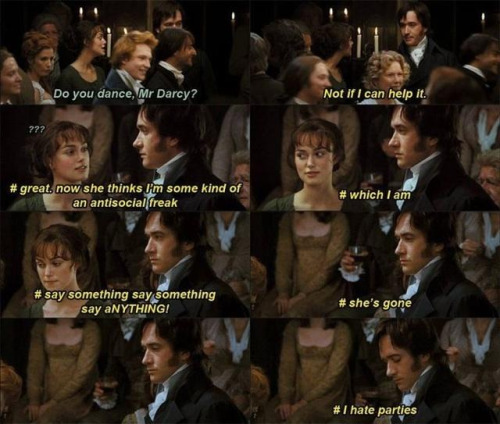 Lizzy and Darcy's blunt conversations, however, are one of my favorite things about this famous couple. They discuss everything. It’s often very much after the fact, granted, but still, they talk it out. Darcy is more than happy to explain himself--that’s the only time INTJs really feel like they’re being understood. Questions are good. Questions allow for odd behavior to be rationally accounted for. And they spark each other’s minds. Sure, they find each other attractive, but first, they find each other interesting. And worth talking to. That--that is the foundation of a good relationship. At least for an INTJ. All this to say, if you ever find yourself with the misfortune of being in love with an INTJ, talk it out. There’s a really good chance they don’t know. There’s also a chance they’re in love with you too, and you’ve been missing their attempts at flirting for the past six months because, well, subtle isn’t our strong suit, no matter which way you take it. Fun Fact: Jane Austen was an INTJ, judging by her letters and other writings. Hence the reason she was able to write one who wasn't a psychopath so convincingly. What's your favorite Mr. Darcy moment?